A recently retired chef won more than enough money to retire comfortably on. Chan Tong Chen bagged the top prize in the $10,000 a week For Life scratch game. He felt lucky on the day he bought the ticket that he bought another when the first one failed to win anything. Even then he had to ask his son to verify his big win after he scratched it. After he chose the $10 million lump sum option, he stands to net about half after taxes are withheld. 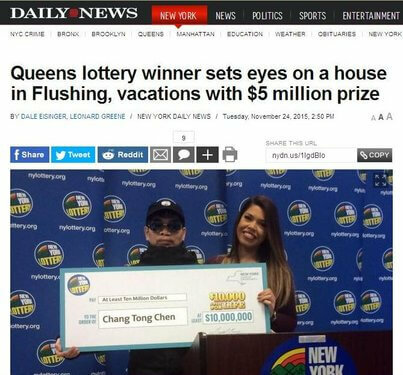 His plans include buying a home in Flushing and going on vacations.